Marie Guy Stephan (facsimile signature) / La Cracovienne / Une Soirée de Carnaval. National dances and settings were popular in the 1840s as audiences became increasingly aware of 'abroad' and exotic locations. Scotland, Spain, Hungary, Poland and the Balkans were all popular settings and some ballets were set as far afield as India, giving the opportunity for balleticized versions of national dances, like the Cachucha, mazurka, polka, polonaise, tarentella or Cracovienne. The yellow flashes on the dancer's boot heels are metal trims or small spurs that 'chime' when the heels are clicked together, a characteristic movement in Polish folk dance and the Cracovienne in particular. The flowers on the floor are the floral tributes thrown by the ballerina's admirers. Marie Guy-Stéphan was born in France in 1818 and danced in Paris and London where she was famous particularly for her Spanish dances. She later became prima ballerina in Madrid. The dancer stands in front of an archway, beyond which is a line of girls, wearing in knee-length, low-necked ballet dresses, and men in 'period' costume. The solo dancer stands, arms folded, on her left foot, the right leg flexed with the toe resting on the ground and the heel against the left lower leg. On her head is a coronet of white roses with long white and green ribbons falling down her back. The neckline off-the shoulder white bodice is trimmed with fringe, under which are loops of green and white ribbons; the below-the-knee pleated white skirt is trimmed to the hem with bands of decorated and green ribbon; from the waist hangs a green and white striped apron with green fringe. On her feet are heelless pale red ankle boots trimmed with green with white flashings on the heel. On the floor are small sprays of pink roses. Marie Guy-Stéphan was born in France in 1818 and danced in Paris and London where she was famous particularly for her Spanish dances. She later became prima ballerina in Madrid. The Cracovienne originated in Poland; the yellow flashes on the dancer's boot heels are metal trims or small spurs that 'chime' when the heels are clicked together, a characteristic movement in Polish folk dance and the Cracovienne in particular. The print is another version of S.2609-1986. The print is part of the collection of dance prints amassed by Marie Rambert and her husband, Ashley Dukes in the first half of the 20th century. Eventually numbering 145 items, some of which had belonged to the ballerina Anna Pavlova, it was one of the first and most important specialist collections in private hands. Rambert bought the first print as a wedding present but could not bear to give it away. As the collection grew, it was displayed in the bar of the Mercury Theatre, the headquarters of Ballet Rambert, but in 1968, Rambert gave the collection to the Victoria and Albert Museum; seven duplicates were returned to Rambert, but these are catalogued in Ivor Guest’s A Gallery of Romantic Ballet, which was published before the collection came to the V&A. Although often referred to as a collection of Romantic Ballet prints, there are also important engravings of 17th and 18th century performers, as well as lithographs from the later 19th century, by which time the great days of the ballet in London and Paris were over. 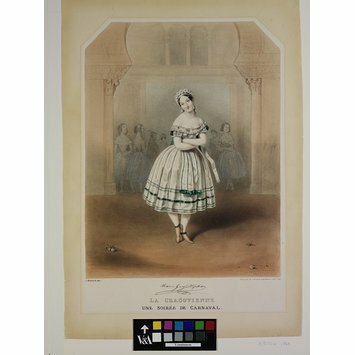 The large souvenir prints of the Romantic ballet, issued in the 1830s and 1840s, are among the most evocative images of dance in the 19th century. 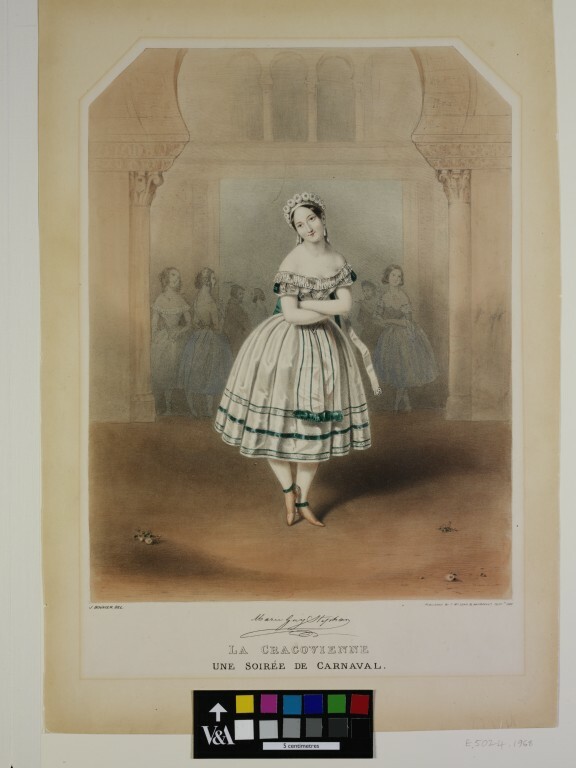 Lithography, with its soft quality, enhanced by the delicate yet rich hand-colouring, was ideally suited to the subject - the ballerinas who dominated ballet in the mid-century and the romanticised settings in which they performed; style and subject were perfectly matched. The lithographs produced in London are notable for capturing the personality and style of individual performers in a theatrical setting. They are a fitting tribute to one of ballet's richest periods. Before the development of colour printing, the basic black and white prints were hand coloured. There is often considerable variation from one print to another, both in colour and quality of the work. The most important souvenir prints, such as this one, would only have been sent out to the best colourists, and it is often very difficult to tell the best hand colouring from early colour printing. In the days before photography, such lithographs were expensive souvenirs, bought by the individual dancer's admirers. Marie Guy-Stéphan dancing the Cracovienne in Une Soirée de carnaval. Lithograph coloured by hand after a drawing by Jules Bouvier, 1842.